I have a problem with using calc. When I have two windows open in emacs, split vertically, calc frequently opens in the wrong window. 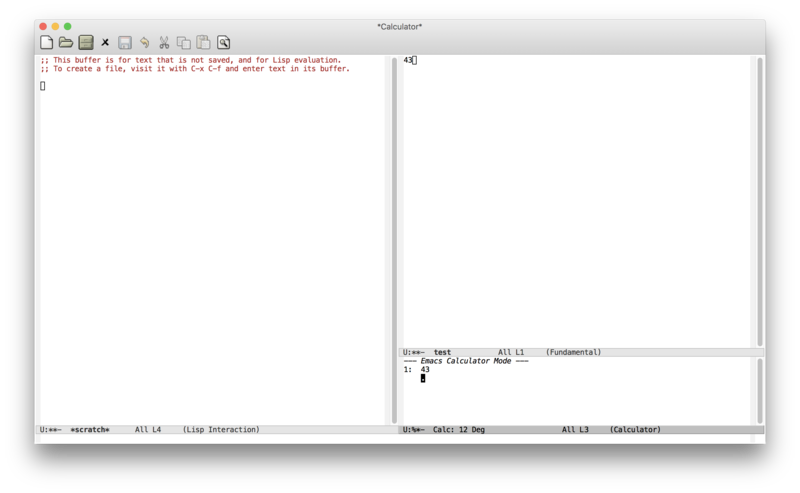 Here's a demonstration of the problem that I ran with emacs -Q.
I wanted the 43 that I yanked into the buffer from calc (with y in calc, which runs calc-copy-to-buffer) to wind up in the scratch buffer (since that's where i started from), but it doesn't. Anyone know a way to fix this issue? The scratch buffer therefore is not a "normal editing buffer". As for the first issue , If you start calc before splitting the window ( with only one buffer showing), you will get both the calc and the trail buffers, which is very useful and will prevent the unwanted behaviour. Not the answer you're looking for? Browse other questions tagged window-splitting calc or ask your own question.